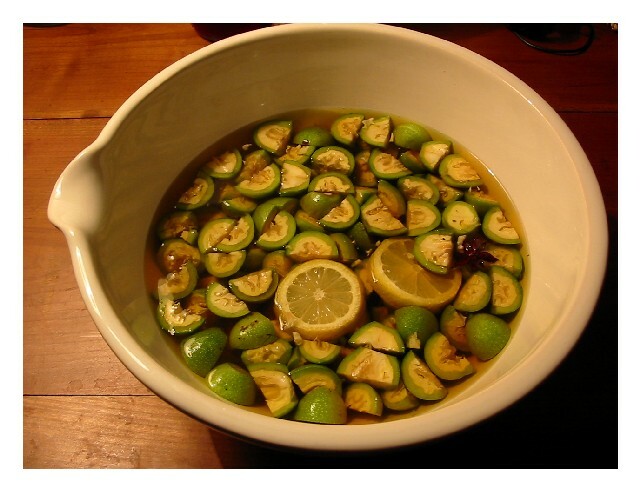 Last year I made a liqueur de noix with green walnuts that came out at the end of June. It was a wild ride into the unknown, and by September we were enjoying the fruits of that effort. I served it to the group at Thanksgiving and by the time mother came to visit in May we'd celebrated enough special occasions with friends that we tapped the last drop of our own vin maison from the decanter. My one big regret last year with the vin de noix was that I did not prepare a much bigger batch. The batch only yielded a bit more than a bottle, but certainly the quality of the elixer was magic. We put what we had into a fancy decanter and served it to enthusiastic friends little by little, using the small glasses, and I always sipped my share with a sad and guilty kind of bittersweet regret. Why oh why did we not make more? My recipe was a kind of montage last year, with my knowledge of my mother-in-law Brigitte's Vin d'Orange and how she likes it strong, and some Italian recipes for nocino. Brigitte puts the Vin d'Orange away in bulk to macerate for several months every late winter. Images of her bottling activities, which take place in the summer, come to mind. Brigitte, wearing nothing but a bikini, in the kitchen with a couple of funnels rotating around into bottles which have been placed on every surface that will take one, and summoning Yves to come and add some muscle while they filter and decant it. For a long time afterward, the diligent sound of pounding comes from the kitchen as she inserts the corks and pounds them in one by one with a rubber mallet. She hands the bottles over to us with a kiss and a pat every time we need a new one, the elixer of her good cheer, reminding us of her sunny disposition (and her hair color as it was for a few years) to be taken whenever we need or even desire a little bit of Brigitte to fill our hearts with joy. The idea to make the vin de noix actually came from Brigitte. I called her, asking her what I could do as a gift wine - she had given me the recipe for her Vin d'Orange once I had been married to Loic for a couple of years and although I definitely loved it and desired to make some of my own I didn't want to reproduce her family gift. She mused that I should be using something local - she gets her bitter oranges from the tree, they grow locally everywhere where she lives. 'Why not Vin de Noix? You are very close to Grenoble and they are famous for the walnuts.' So the idea was born, and I sat on it for awhile. I inquired when I might get some nuts for the vin de noix, and it was explained that they are ready to pick on the 3rd Sunday of June, the Fete de St. Jean, St. John the Baptist day. The first year we missed the window, mainly because we didn't approach the right man. As everyone knows, sometimes the vendors at the market are not actually producers and don't understand their product. I approached a vendor who was selling nothing but walnuts from a very minimal operation and who looked somewhat like a walnut himself, in fact his entire being exuded the idea of walnut from the faded ash brown color of his hair to the suede boots he was wearing. You look at the fellow and are drawn into a long epic tale about the hardship and joys of walnuts. But it was just an act, one of those theatrical costumes that he had taken as far as living it out like one of those medieval actors you find at a theme park. We unfortunately find this at the markets here more and more often these days, and back then I was tricked. He quite knowlingly told me that green walnuts weren't ready yet. Those who are not in the know about their own product and what it's good for stubbornly deny the availability of such things as green walnuts. We glissed in perilous dismay through the window that year. Then around mid-June during the next year, I identified and befriended an actual nut producer at the market on a Thursday and he confirmed and enthusiastically agreed to my plan. This one looked like a normal guy and after a bit of questioning it was clear he was the real deal. The nuts have to be used quickly after they're picked, and they have to be picked at just the right time. During the time when we had arranged for the pickup, I was in Paris with my niece, our last hurrah at the end of her stay with us before I deposited her on a plane at CDG bound for her home. We were just near the Sacre Coeur and overlooking the glorious city, I called and confirmed by portable phone that my authentic nut friend had the goods and then made another call to Loic to ensure that he hadn't forgotten his appointment to get them. The first advice you'll see in any vin de noix recipe worth its weight is that you must wear gloves and not use a wooden cutting board when you make your vin de noix. This advice is not to be taken lightly. The immature nut pods exude a fluid that turns yellow, then brown, and then into an indelible black stain that is not unlike the semi-permanent henna tattoo. This staining liquid can seep into the tiniest crevices and take weeks to go away. Use gloves. Don't slice your walnuts on wood. Scrub your plastic cutting board with hot soapy water and a brush the moment you're finished cutting the nuts. Last year's recipe did not use wine and experimented with spices, a liqueur. I had tasted the vin de noix and aperetif drinks on offer in the various tourist trap shops and wanted to shoot much higher. I knew that the taste of the nuts has a lot of character. The other thing was that I really wanted to avoid the sugar syrup flavor that grabs you like barba papa from the commercial versions. So my idea was to use another sweetening agent, something that harmonizes gracefully with nuts and won't just seem cheap and sweet. Grade B Maple syrup was my choice. I mixed this up in a large bowl, covered it, and let it sit for a few months. At 2 weeks I became afraid that the star anise was going to take over, so I removed it. The result at the 2 month mark was slightly bitter and maybe a bit medicinal, due to the high alcohol content. I bottled it and put it away for some more time, and at month 4, it had mellowed and rounded out, and something happened to the flavors that was extraordinary - it was clearly something special. Very special. I mean this stuff was so incredibly delicious it became kind of like a precious nectar we had to guard and treat with kid gloves. We began serving it to friends and also using it to prepare a special sauce for magret de canard and drop by drop it dissapeared. This year I wanted to multiply my output by at least 10, but realized we could not afford all of the vodka that would take. I did some more research into what went into various traditional French vin de noix recipes, and settled on some changes to my recipe this time. This is for a less alcoholic drink but still something with some serious punch following in the family tradition. It will produce 12 gift bottles plus a little stash on the side for sipping and cooking here at home. This year I omitted the star anise, and introduced szchuan peppercorn, due to the pleasant things I've discovered during cooking about the light floral flavors it imparts. I replaced the lemon with orange, and used a bit more per volume because I enjoyed a nice warmed up glass of last year's wine on a cold late autumn day with an orange slice and it was a great compliment. I replaced the cinnamon with the traditional cloves. And last but not least, instead of dry vermouth, my vin de noix is topped with a hearty full bodied white Burgundy wine. Noted below, the ratios per 1.5 liter jar. top off with a full bodied white burgundy (Bourgogne) wine (used 5 bottles to fill all 6 of the jars to the top). Vin de noix, in order to turn it's beautiful deep dark color, needs contact with some air. This is why mason jars are perfect for this - because you can close them without using the rubber gasket and they'll have enough air circulating to allow the liquid to turn black. Once 2 months have gone by, filter and bottle your vin de noix. Seal the bottles tightly then, and allow it to mature for another month or two before giving it away. By all means, taste it at every step, to understand how it develops and what to expect. You'll be suprised at the many different stages it goes through. I'll report back when this is ready to bottle. I've been dying to make an infused lemon/vodka! Why not do it today? There are some very good recipes for limoncello to be found. The thing about the lemon is that you must respect the time you let it sit to the letter or else it can turn bitter. The walnuts are spent at about 2 months. I could let it sit like that much longer until I have a convenient moment to strain the wine. Another thing I have have tried and enjoyed were the various "punches" masterminded by the people of the Ile de la Reunion. We have a friend originially from the island who gets a shipment of this from his parents yearly. They infuse lychee (whole thing shell and all if I recall) and a home made raw sugar syrup in Rum for 3 months. Devilishly good and dangerous if you're not careful to watch how much you're drinking. Interetsing post. And what a rewarding venture! thanks for the comment, jenjen! Dear Lucy: who is your "nut" man? Do you know anyone selling walnuts in the San Francisco Bay Area? Thanks. Hey Mehrdad! I get the nuts from a producer on the Market St. Antoine. You won't see green walnuts until at least the 2nd half of the month of June. Ask around in advance at your local farmer's market and someone is bound to know who might have them. We sell green walnuts and will ship them to you if you can't come pick them yourself! I am an accidental nut producer! I have a walnut tree that is going off right now, and your post is such an inspiration. What a beautiful story and photos. Excellent. I'd love to see how your really home made wine does this year. We also have a walnut tree behind the house in the mountains now, so I don't have to get the nuts from the market anymore. Next weekend we'll gather them. My second batch is laying down right now. I use brandy but am intrigued by the Noilly Pratt idea. Next year I'll give that a shot. I'm also intrigued by the Maple Syrup (I used organic pure cane sugar). Maple syrup makes me think treacle, molasses, or even dark Belgian Candi syrup (by-product from Belgian Candy mfg, and I use it to brew my Belgian dubbel) would be excellent additions! Thanks for your post, we have two rather large walnut trees and I stumbled upon the notion of Vin de Noix because I wanted to do something with our Walnuts, but could get excited enough about Noccino. I'm cultivating multiple recipes for a taste test next year. Thanks again. Your photo's and recipe has inspired me to make several batches of Vin de Noix, using our own home made maple syrup, and White Burgundy, in one and the other with a Red wine, and a small addition of Aquavit. I thought the taste might blend well with the Star Anise, Cloves and Vanilla Bean. Thanks so much for the inspiration, and all of your postings. Can you say any more about how to know when the nuts are ready? Or when they are past? I live in Portland, Oregon and we've had a long cold spring. About three weeks ago I started a batch. The infusion smells great and has turned black as ink. The nuts were pretty big and inside they were starting to brain up on the inside. But just today I picked another (from a different tree). It is still soft enough to chop up and is a little more differentiated inside. I'm wondering if I rushed it? What happens to the flavor if you are too early? Too late? Here in France we pick them on the third Sunday of June, St. Jean, give or take a week. Ideally they should be white inside when you cut them, and once cut they quickly darken. If you got yours going around the first week of July I doubt you were too early even if Spring rolled out more slowly this year in Portland. The infusion taking on the black color is a good sign. Hi, another reader from Portland, Oregon. This is my first year experimenting with liquors and it is fun having little "experiments" going on in my pantry and countertops! Just wondering, my liquor de noix has a distinct bitter edge to it. I left it to infuse for the full 2 months before straining it. Will it mellow more over time? I was wondering if I left it for only a month to infuse if that would be better? I also made a green walnut wine with a merlot that tastes like a brandy and a rhubarb infused vodka that is a lovely rhubarb pink color. This is very similar to an Italian walnut liqueur called "Nocino". So it should be just as good (or even better! ), poured over vanilla ice cream. Yet another commenter from Portland, in the Liqueur de Noix recipe you call for a bottle of Vodka-how big of a bottle? 500 ml? This looks like an excellent liqueur, can't wait to try it. Hi! I would use 1 liter of vodka. Have fun next summer! I have been making vin de noix each summer, using a recipe that I got from a producer in Martel, France. I have never tried using maple syrup in it, and now that I live in NZ I think I'm not likely to start (it's really expensive here). Do you think it would work to replace it with sugar? Yes, you could use sugar, make a 1:1 ratio by volume sugar syrup to replace the maple syrup. Thanks for coming by!